Following a week of intensive deliberations behind closed doors in the UN Security Council, The Arab Group in the United Nations walked out of meetings in belief that it is important to widen their efforts beyond traditional tools within the Security Council to ensure that the international community is not leaving behind established bases of a settlement in the Middle East. At the same time, it is critical to work on protecting Palestinians from the atrocities committed by Israel. Ambassador Maged Abdel-Fattah Abdel-Aziz, representative of the Arab League to the United Nations, discusses the latest developments. The message given by the UN Security Council today, the Kuwaiti representative said as the Arab draft resolution on Gaza was vetoed, is that “the occupying power enjoys an exception”. How can such a dichotomy in the international organisation be addressed? In analysing the vote on the Arab draft resolution, presented and negotiated by Kuwait as the Arab member of the Security Council, and by examining various explanations of country positions, before and after the vote, we can only conclude that the opposition to providing protection to the Palestinian population from the atrocities committed by Israel, the occupying power, is coming from one permanent member of the Security Council. There was no surprise in saying that this opposition was expected as part of the overall policy taken by the current administration of that member in dealing with the situation in the Middle East, including the Palestinian question. But as you know, the responsibility of maintaining peace and security is not exclusively shouldered by the Security Council. The resolution got 10 votes in favour, and that opens the door for the Arab side to resort to the General Assembly under the “Uniting for Peace” resolution. There is also the possibility to resort to the Human Rights Council, particularly as it has just adopted a resolution to dispatch a fact-finding mission to investigate allegations against the IDF in the events that started on the “Day of Return” on 30 March and afterwards, resulting in the killing of more than 100 Palestinians and injuring thousands more, including the massacre committed on 14 May in conjunction with the opening of the US Embassy in Jerusalem. There is also the International Criminal Court (ICC) that should be used to apprehend and prosecute those responsible. The last Arab summit in Saudi Arabia, the Quds Summit, gave the mandate to the Arab group of ambassadors to follow up on all those tracks and we will do so. In April, you denounced external financing and support for terrorist groups settled in the Middle East. In a speech in an open debate in the Security Council, you focused on how it has been possible for terrorists of the Islamic State (IS) to keep logistics in several countries, despite the strong offensive against them. Did you mean specific countries? What can the UN do to stop such illegal procedures? Despite the fact that we have about 13 international conventions governing counter-terrorism activities, the lack of agreement on the comprehensive Counter-Terrorism Convention is regrettable, particularly if you know that one of the two contentious issues is the distinction between terrorism and the activities of national liberation movements. In the last few years, and specifically since the 2005 summit of the UN, the General Assembly established a comprehensive framework for international cooperation in countering terrorism, the UN Counter-Terrorism Strategy, that is reviewed every two years. One of the pillars of this strategy is to stop funding flowing to terrorist organisations like IS, Al-Qaeda, Boko Haram, Al-Shabab, the Muslim Brotherhood and others, but regrettably we still see that those organisations are getting funded, and some of the funding is external, and continues contributing to destabilising many countries, including in the Middle East. That’s why I called for tighter regulations on funding within the ongoing review process of the strategy that is under negotiation and expected to be adopted before the end of the 72nd General Assembly session. Since you played a leading role in the establishment of the Human Rights Council, how do you see the discussions concerning human rights issues inside the council, taking into consideration the misunderstanding of our war against terrorism in Egypt and the Arab world? Respect for human rights and fundamental freedoms is one of the three pillars of the work of the United Nations. That is why the General Assembly decided in 2005, when I was the permanent representative of Egypt to the UN, to replace the Commission on Human Rights with the Human Rights Council, with much more authority to deal with violations. Respecting human rights requires guaranteeing commitment to the implementation of international law, including the UN Charter, international humanitarian law and international human rights law. Those laws, and the Universal Declaration of Human Rights, as well as several General Assembly and Security Council resolutions, stress the need to respect human rights while countering terrorism. In this regard, all Arab countries, including Egypt, are doing their level best to ensure that while continuing their war against terrorism, no human rights violations are committed. But as the terrorist groups and organisations themselves are severely violating the human rights of innocent civilians, including their right to life itself, while intensifying their media campaign against our countries, our countries have to do better in revealing to the outside world the atrocities that those groups commit against our citizens and the concrete measures that we take with full respect to our commitments. This will close the option of those groups presenting their baseless allegations to the council and other human rights mechanisms regarding actions taken by governments. The international community failed to convince the US government to alter its position on the humanitarian situation in Gaza and it seems the US administration is not open to criticism. What is the role of the Arab League here? The Arab League and its member states, while criticising the decision by the US administration to cut its support to UNRWA and to reduce its financial assistance to the Palestinian Authority, increased its funding to the state of Palestine. You might recall the decisions by many Arab countries to increase their financial support to Palestine in response to these decisions. Kuwait, Saudi Arabia, the UAE, Qatar and many others made additional financial contributions. Some other non-Arab countries are also considering doing the same. The last Arab summit also adopted a decision to support the trust fund created to deal with the needs of Palestinian refugees, and funds are starting to appear. 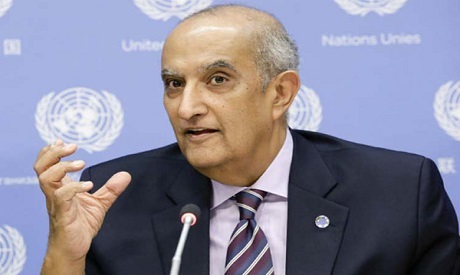 Arab League Secretary General [Ahmed] Abul-Gheit is in close touch with the UN, the EU, the World Bank and the donor community at large, generating financial support for Palestinian refugees and those in humanitarian need in Gaza and the West Bank. Since the Trump administration came to power we see there are no peace negotiations taking place. We hear about the “deal of the century”, but have not seen it. Does the Arab League believe that there is still a peace process to be perused? The Arab League and its member states believe in international legitimacy as reflected in numerous resolutions of the Security Council, the General Assembly, the Madrid Principles, Quartet decisions, and the Arab Peace Initiative, among many pillars of the peace process. This international legitimacy is based on the two-state solution and the establishment of a viable Palestinian state with East Jerusalem as its capital. The fact that the new US administration decided to defy this legitimacy and proceed in a different direction through moving the US Embassy to Jerusalem and trying to avoid entering into negotiation on the basis of the five final status issues (namely borders, Jerusalem, refugees, water and security) is creating a stalemate in the peace process. We trust the intentions of the US administration and we are intensifying our negotiations with it to ensure that international legitimacy will be respected. This is the only way we will have peace in the Middle East.